SYNTIVIA uses a new 3D skin model, an epidermal spheroid, to evaluate cosmetic and dermatological ingredients. The epidermal spheroid is a unique and patented 3D model that contains the two major cell types of the epidermis, i.e. Normal Human Epidermal Keratinocytes (NHEK) and Normal Human Epidermal Melanocytes (NHEM). The epidermal spheroid faithfully reproduces the organization and functionality of normal epidermis. Proliferative cells are located at the periphery as well as in the basal layer. Differentiated keratinocytes are situated towards the inside of the spheroid that reproduces the stratum corneum (Figure 1). 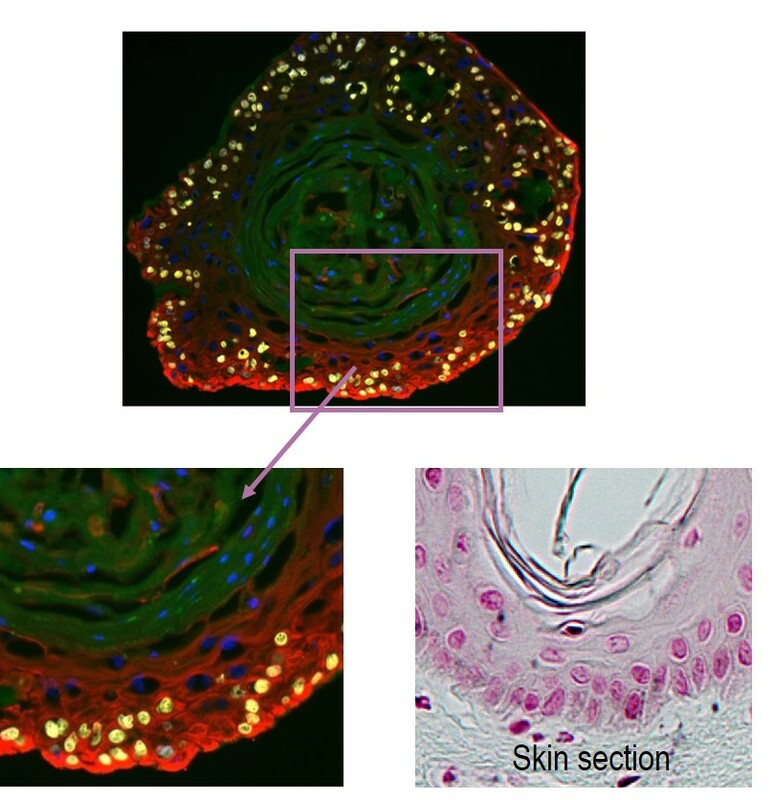 Recent work on a specific pathway enabled us to analyze, within the 3D skin model, the gene expression of several targets that are implicated in the process of inflammation to study the effect of pro-inflammatory treatments on the spheroid. Our study focussed on UVA irradiation, a well-known natural inducer of inflammation, and a pro-inflammatory cytokine. The UVA exposure and the cytokine treatment caused changes in several metabolic pathways related to inflammation. The induction of inflammation was observed through the over-expression of pro-inflammatory genes such as IL1A, IL6, IL8, COX2, FST and TNFA and the decrease of anti-inflammatory gene TGFB1 (Figure 2). The extra cellular matrix (ECM) was also impacted by the induction of metallo-proteases expression (MMP1, MMP3 and MMP9), which are involved in the degradation of the matrix during inflammation. ECM structure was also affected by the decrease in Fibrillin genes (FBN1 and FBN2). An induction of stress-response genes with HSPA9 and HSPB1 and a decrease of the antioxidant defenses (GPX1, MSRB2 and GLRX) were also noted (Figure 2). The results of this study confirm that SYNTIVIA’S new epidermal spheroid is a fully functional 3D skin model. Applications are not limited to inflammation and can be extended to the evaluation of soothing effects and anti-aging effects of active cosmetic ingredients.